Initially, we did not know much about it. It looked like a religious work, and we guessed it was written in Cyrillic. The book was in a neglected state, had needed a lot of attention. 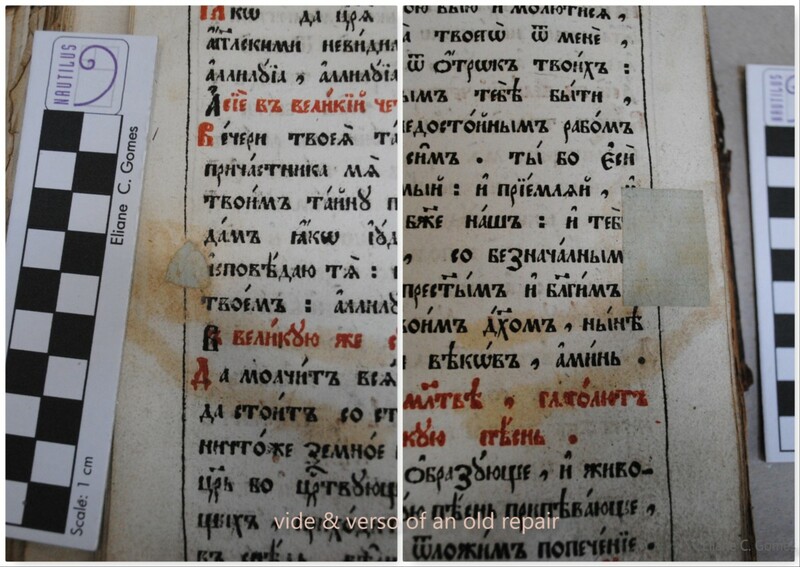 I showed it to my restoration teacher, and he had a hunch it was Russian in origin. My teacher, Hans Pieterse1, knew someone who could shed more light on its origins. 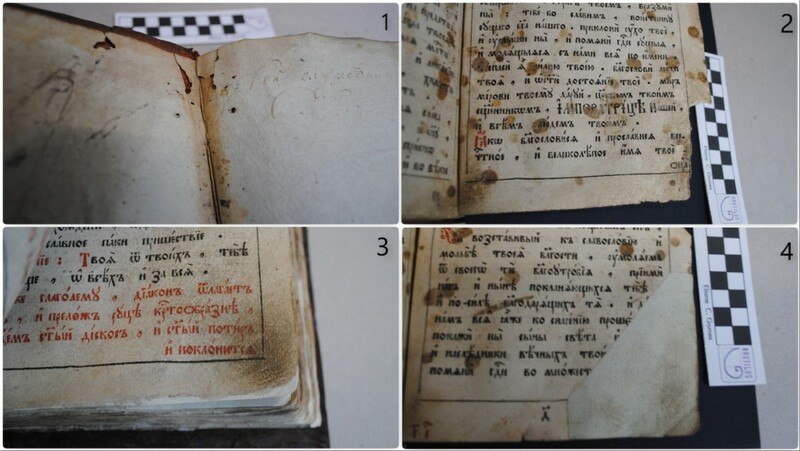 After several weeks, my teacher told me he had contacted Dr. Stefan Royé2 who has identified the object as a Slavonic Liturgical Book. A priest of the Orthodox church used it during religious services. I was nicely surprised by the rather lengthy description he so kindly wrote to me about the book’s contents. He has found a prayer to the Empress Catherine the Great in the book which allowed us to date it as an 18th-century work. However, no other marks were found, so we did not know to which period of her reign it belonged. With that on my mind, I started the restoration procedures. I could still smell the church incense impregnated in its pages which was a very comforting factor. 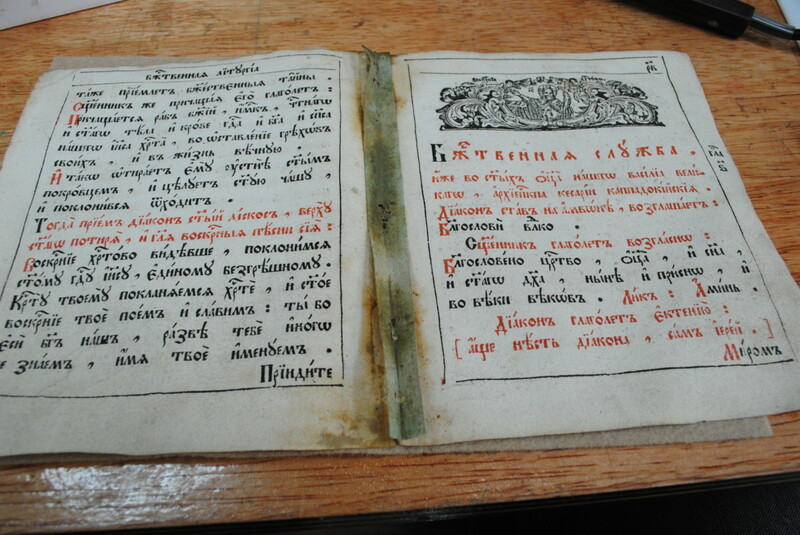 There were candle wax drops all over the pages devoted to the evening prayers, blackened thumb marks on the pages’ corners and some very creative old restorations. The Liturgical Book was telling many stories at each next page I turned. I have dry cleaned the book, but kept all wax, thumb marks, and creative old repairs unless they were perceived as a threat to the integrity of the book. I even decided not to re-sew the book and worked with four needles in the areas where the gatherings were loose. Some page corners received reinforcements and repairs with Japanese kozo paper. The overall plan was to keep its original characteristics intact as much as possible. I strongly believe in the minimal intervention approach, despite the ±120 hours of work I invested in this project. While cleaning the book, I have found a paper watermark, which looked much as the one of “Pro Patria” with the added monogram “АГ”. 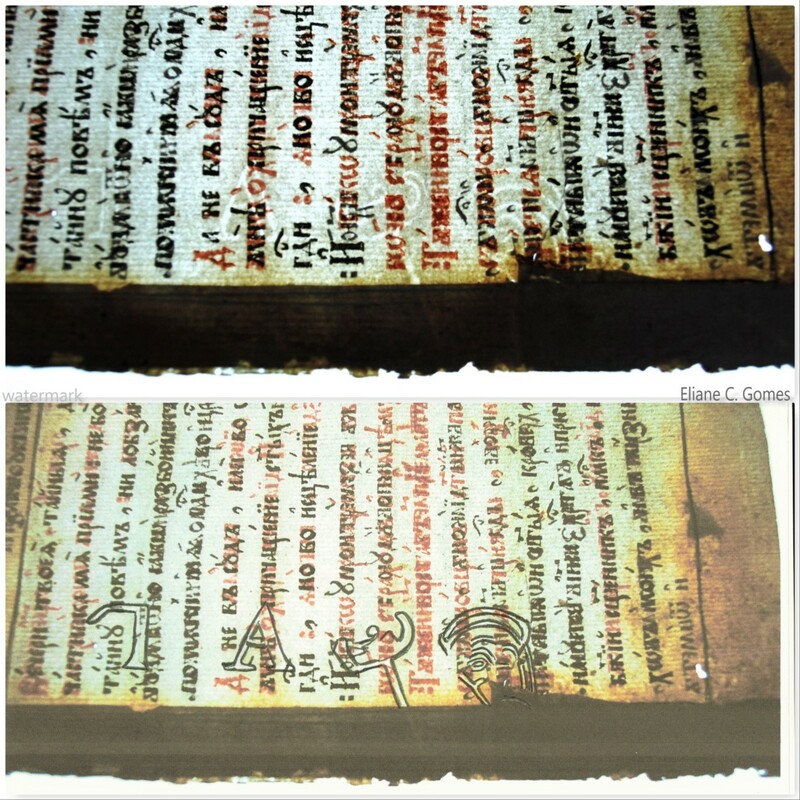 Unfortunately, watermarks are not a precise method to date a book. Paper in the past was an expensive commodity and could be produced in one year and be used many years after its production. However, in this case, it did help me to shed some more light on the period of the book production. According to my research the paper made was made at one of the paper mills of Afanasy Goncharov (Афанасий Гончаров). It was produced in the last third of the 18th century which narrows the date range to the last decades of the reign of the Catherine the Great. The Goncharov paper mills were located in Russia and produced laid papers of higher quality compared to the other Russian mills active in that period. The book structure was a tight back using wooden boards with frayed out extended sewing supports, covered in a type of leather I could not precisely identify. Even the cover had been restored before and also had a burn mark. I can just suppose the repairs were done by a priest and the burn mark was made during service by a candle standing too close to the spine. One of the wooden boards was also damaged. At this point, I started to consider options on how to approach the restoration of the board’s integrity. I consulted with a carpenter who explained to me that a wood insert would need some “foreign intervention” to the original board: like pins and the use of a different kind of wood plus the use of a heavy-duty industrial and non-reversible glue to do the job. Not cool! 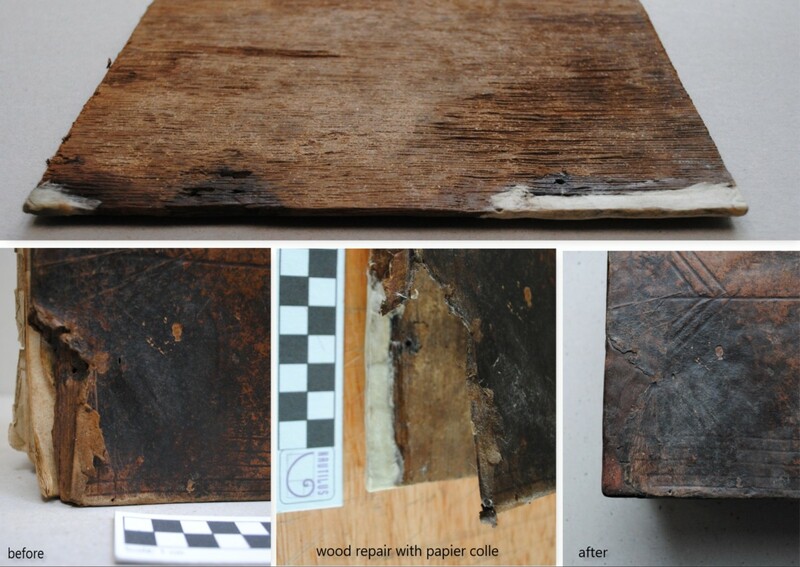 I chose to restore the missing wooden part using a papier-collé technique. Japanese paper and wheat paste are mushed together, moulded to form the extension of the wooden board and attached to the wood using warm animal adhesive. The added material would be shaped and carefully sanded. Once it is covered, no one would notice the difference. I know it is controversial to use this type of adhesive. But the whole inserted area remains fully reversible, strong enough and light. It was then covered with an extended piece of calf leather brought to colour. 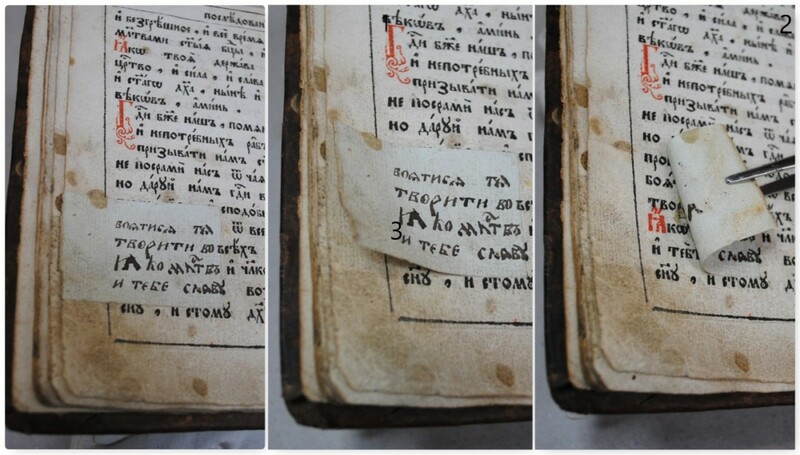 After the book restoration was finished and the report done, my friend managed to come forward with some more information over the book and how it came to his hands. Apparently, during the Great War, his German ancestor was taken as a war prisoner in Russia. He managed to escape the prison, and on his way home, he decided to plunder a church. He stole an icon and the book from there. Books were expensive in the older days, and this book was intensively used and of good quality paper. 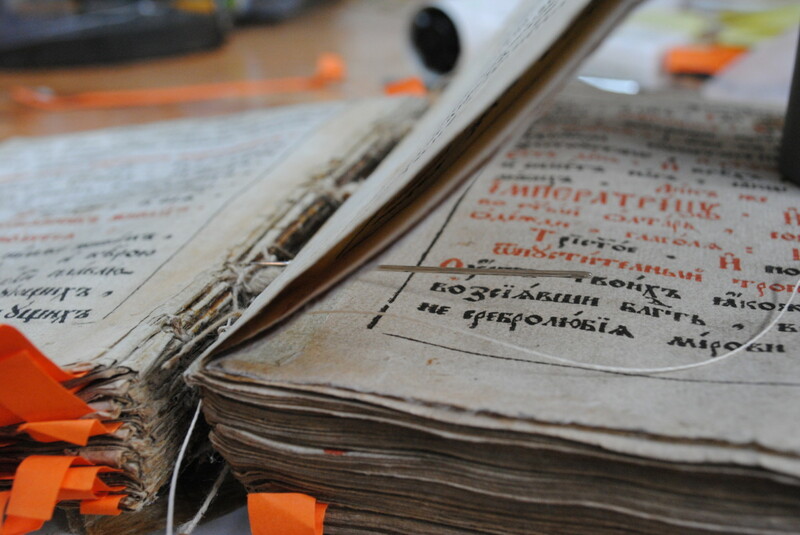 I opened a bottle of wine and pondered about the despair of the priest with the disappearance of his prayer book, later restored by me, a Brazilian living in the Netherlands… who has passed her restoration finals with this project. What are the odds? Dr. Stefan Royé is a member of the Research Department Sources of the Protestant Theological University (PThU, Amsterdam,) and CBM programme coordinator and secretary of the Academic Board.